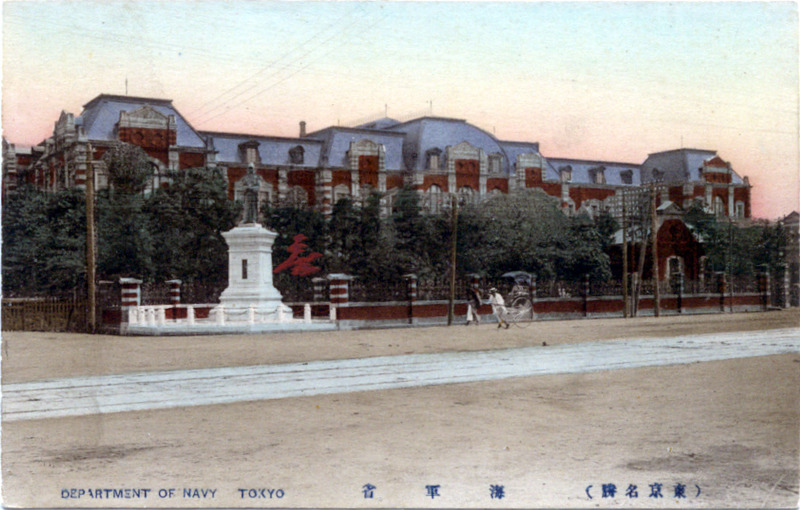 Navy Ministry, Kasumigaseki, c. 1910. Designed by Josiah Conder. From the wiki: “Josiah Conder was a British architect who worked as a foreign adviser to the government of Meiji period Japan, earning him the nickname ‘father of Japanese modern architecture’. “Recruited by the Japanese government to become Professor of Architecture at the Imperial College of Engineering, 24-year-old Conder arrived in Tokyo in January 1877 and quickly established a reputation as a dedicated and highly skilled teacher. His curriculum included not only extensive training in architectural practice but also drawing, technical draftsmanship, and architectural history and theory. Conder taught five of the most famous Meiji-era Japanese architects: Tatsuno Kingo (‘Bank of Japan‘, ‘Tokyo Central Station‘, ‘Manseibashi Station‘), Katayama Tōkuma (‘Akasaka Detached Palace‘), Sone Tatsuzō, Satachi Shichijirō and Shimoda Kikutarō, who were among the first Japanese architects to build western-style buildings in Japan. 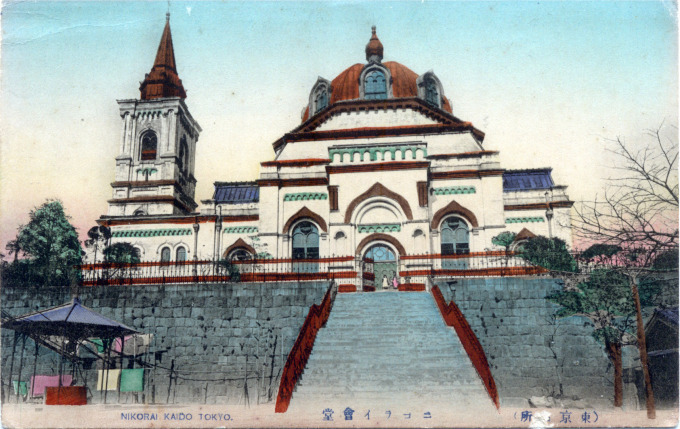 Among the Josiah Conder-designed buildings still standing in Tokyo: Holy Resurrection Cathedral (Nikolai Cathedral), at Ochanomizu. “Conder developed a keen interest in Japanese arts and after a long period of petitioning, was finally accepted to study painting with the artist Kawanabe Kyōsai. Kyōsai dubbed Conder Kyōei, incorporating the character ei (英) from the Japanese name for Britain. Conder also studied the Enshu school of Ikebana. His studies led to a number of publications, among them ‘The Flowers of Japan and The Art of Floral Arrangement’ (1891), ‘Landscape Gardening in Japan’ (1893) and ‘Paintings and Studies by Kawanabe Kyosai’ (1911).